4 in 1: The Complete One-Week Preparation for the CISCO CCENT/CCNA ICND1 Exam 640-822 with Three CISCO Simulated Exams is an intensive, one-week study guide that provides students with all the knowledge they need to excel on the CCNA/CCENT exam. This certification guide is designed to make even the most difficult internetworking concepts easy to understand. Author Thaar AL_Taiey highlights critical information, outlines necessary procedures, and identifies exam essentials. Students can understand the concepts and, then, test their knowledge on more than two thousand, one hundred and sixty challenging questions that mimic the formats found on the exam, including multiple-choice-single-answer, multiple-choice-multiple-answers, fill-in-the-blank, testlet, drag-and-drop, and simulations. 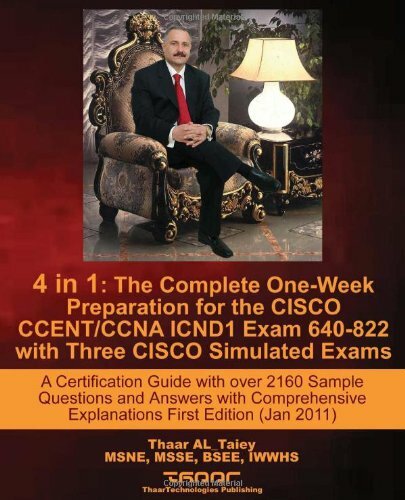 4 in 1: The Complete One-Week Preparation for the CISCO CCENT/CCNA ICND1 Exam 640-822 with Three CISCO Simulated Exams provides in-depth coverage of all official CCNA/CCENT exam objectives and uses 2800 router, 1841 router, catalyst 2960 switch, and many other CISCO devices to clarify the required concepts. The book uses many highly-professional figures, exhibits, tables, configurations, and real internetworking scenarios to clarify the required concepts. It also provides up-to-date information on the newest catalyst 2960-S switch and 802.11n wireless technology. Designed and organized for absolute beginners as well as for CISCO internetworking professionals. 4 in 1: The Complete One-Week Preparation for the CISCO CCENT/CCNA ICND1 Exam 640-822 with Three CISCO Simulated Exams gives students the necessary foundation to overtake the CCNA/ CCENT exam with extreme confidence and post high scores. The following CISCO CCNA/CCENT topics are covered carefully in this book: • Describing the operation of computer data networks • Describing the required CISCO Devices for CCENT • Operating CISCO Switches and Routers • Implementing small switched CISCO networks • Implementing an IP addressing scheme and IP services to meet the network requirements for small and large offices • Implementing a small and a large routed network • Managing and verifying CISCO switches and routers • Explaining and selecting the appropriate administrative tasks required for a WLAN • Implementing and verifying several WAN links • Identifying security threats to a network and describing general methods to mitigate those threats •Describing Wireless technology. If you have any questions about this product by thaartechnologies, contact us by completing and submitting the form below. If you are looking for a specif part number, please include it with your message.